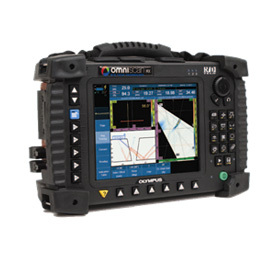 PAUT is an advanced method of ultrasonic testing that has applications in medical imaging and industrial non-destructive testing. Common applications are to non-invasively examine the heart or to find flaws in manufactured materials such as welds. Single-element (non-phased array) probes, known technically as monolithic probes, emit a beam in a fixed direction. 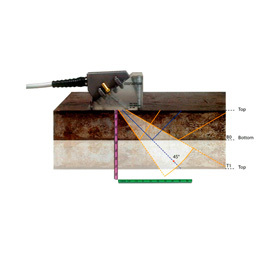 To test or interrogate a large volume of material, a conventional probe must be physically scanned (moved or turned) to sweep the beam through the area of interest. In contrast, the beam from a phased array probe can be moved electronically, without moving the probe, and can be swept through a wide volume of material at high speed. The beam is controllable because a phased array probe is made up of multiple small elements, each of which can be pulsed individually at a computer-calculated timing. The term ‘phased’ refers to the timing, and the term ‘array’ refers to the multiple elements. 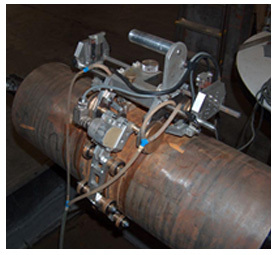 Conventional ultrasonic transducers for NDT commonly consist of either a single active element that both generates and receives high frequency sound waves, or two paired elements, one for transmitting and one for receiving. Phased array probes, on the other hand, typically consist of a transducer assembly with from 16 to as many as 256 small individual elements that can each be pulsed separately. These may be arranged in a strip (linear array), a ring (annular array), a circular matrix (circular array), or a more complex shape. As is the case with conventional transducers, phased array probes may be designed for direct contact use, as part of an angle beam assembly with a wedge, or for immersion use with sound coupling through a water path. Transducer frequencies are most commonly in the range from 2 MHz to 10 MHz. A phased array system will also include a sophisticated computer-based instrument that is capable of driving the multi-element probe, receiving and digitizing the returning echoes, and plotting that echo information in various standard formats. Unlike conventional flaw detectors, phased array systems can sweep a sound beam through a range of refracted angles or along a linear path, or dynamically focus at a number of different depths, thus increasing both flexibility and capability in inspection setups. 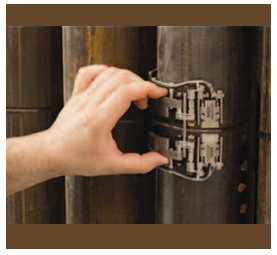 The PA probe consists of many small ultrasonic transducers, each of which can be pulsed independently. By varying the timing, for instance by pulsing the elements one by one in sequence along a row, a pattern of constructive interference is set up that results in a beam at a set angle. In other words, the beam can be steered electronically. The beam is swept like a search-light through the tissue or object being examined, and the data from multiple beams are put together to make a visual image showing a slice through the object. 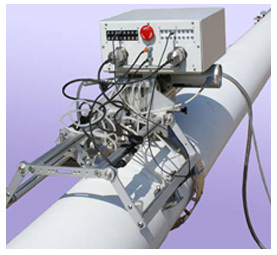 Phased array is widely used in several industrial sectors, such as construction or power generation. 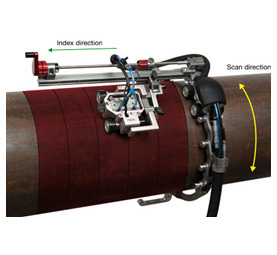 This method is an advanced NDT method that is used to detect component failures i.e. cracks or flaws and thereby determine component quality. Due to the possibility to control parameters such as beam angle and focal distance, this method is very efficient regarding the defect detection and speed of testing. Apart from detecting flaws in components, phased array can also be used for wall thickness measurements in conjunction with corrosion testing.